State and local police officers gather near a McDonald’s restaurant on Route 1 in Bucksport on Halloween 2018 after a man barricaded himself in a house down the road. The man, Bucksport resident William Benjamin, was indicted April 4 on multiple charges as a result of the lengthy standoff. A Bucksport man who fired a shot inside his home last Halloween and threatened to detonate a hand grenade has been indicted on several charges by a Hancock County grand jury. Route 1 in Bucksport was closed for several hours on Oct. 31 as a result of an ensuing standoff with police. William Benjamin, 57, was indicted April 4 on two counts of attempting to cause a catastrophe, which is a Class B felony. He also was indicted on felony Class C charges of criminal threatening with a dangerous weapon, terrorizing with a dangerous weapon, reckless conduct with a dangerous weapon and criminal use of explosives. The grand jury also indicted Benjamin on a misdemeanor charge of creating a police standoff. A Class B felony is punishable by a sentence of up to 10 years in prison and a $20,000 fine, while a Class C felony conviction can result in sentences of up to five years in prison and a $5,000 fine. Last fall, local police responded to Benjamin’s Route 1 home on Halloween after a local medical facility called them to report that Benjamin had threatened to use the hand grenade, police said at the time. During the standoff, Benjamin had several guns in his home and a grenade, police said. Nearby businesses were evacuated and police cordoned off the area around Benjamin’s home. 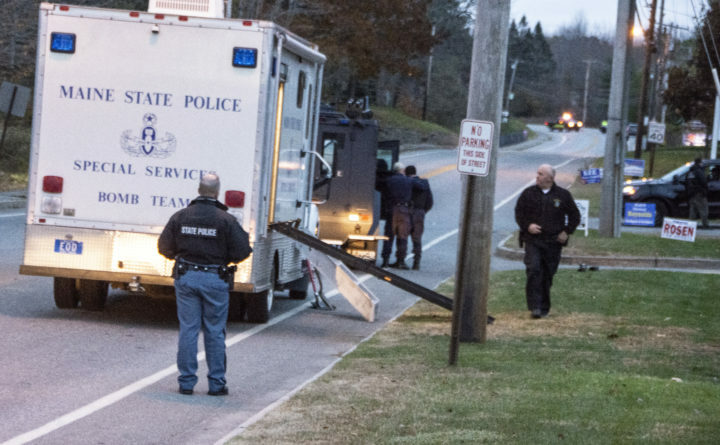 A Maine State Police tactical team responded to Bucksport to assist the local police department in resolving the standoff. Officers contacted a woman inside the home and learned of the fired shot, Bucksport police have said. Police were able to remove the woman from the house, but Benjamin would not leave, making more threats to detonate the explosive, police have said. The standoff ended more than seven hours later after “a lengthy negotiation” with Benjamin, police have said. No injuries were reported as a result of the incident. According to documents filed in Hancock County Unified Criminal Court in Ellsworth, Benjamin had been suffering from apparent mental health issues in the week leading up to the standoff.